The Fraction 3 is an extension of the Fraction plus, Fraction 2 and Fraction Bench ranges. The Frac.. The Harlow Wave Desk is part of our new Harlow Desking range, it comes with an 8 year guar.. The Harlow Ergonomic Corner Office Desk is part of our new Harlow Desking range, it comes..
Harlow Desk High Bookcase. 600mm deep unit One adjustable shelf Can be used as desk end s.. The Harlow wooden bookcase is part of the Harlow Range, this bookcase is perfect finish for your of..
Harlow Desk High Cupboard. 600mm deep unitLockable One adjustable shelf Can be used as de..
Harlow Locking Wooden Office Cupboard is available in 5 MFC finishes (Beech, Maple, Oak, Walnut and .. The One Cantilever Straight Desk is ideal for use both home and commercial offices. It is available .. The One Panel End Wave Desk is ideal for use in both home and commercial offices. It is 1600mm wide,.. The One Panel End Corner Office Desk is ideal for use both home and commercial offices. It is availa.. The One Plus Cantilever Straight Desk is ideal for use both home and commercial offices. It is avail.. The One Cable Managed Straight Desk is ideal for use both home and commercial offices. It is availab.. The One Cantilever Corner Office Desk is ideal for use both home and commercial offices. It is avail.. The One Cantilever Wave Desk is ideal for use both home and commercial offices. It is 1600mm wide, a.. The One Plus Cantilever Wave Desk is ideal for use both home and commercial offices. It is 1600mm wi.. The One Plus Cantilever Corner Office Desk is ideal for use both home and commercial offices. It is .. The One Mobile Pedestals are our stylish and practical storage pedestals. They are available in 2 an.. The One Pedestal is part of the One Office range. It is made to fit underneath the One office desks,.. The One Desk High Pedestal is our stylish and practical storage pedestal, it compromises of 2 shallo.. The One Filing Cabinets are suitable for use in both home and commercial offices, available in eithe.. The One Side Filer is ideal for home or commercial office use. The One Side Filer is our heavy duty .. The Round Meeting Room Table is our strong, durable table available in 7 colour finishes (Beech, Dar.. The One Rectangular Tilting Table is ideal for use in meeting rooms and boardroom areas, it is also ..
TR10 Commercial Desking is the cable managed space saving solution for your office. The cantilever l..
TR10 Commercial Desking is the cable managed space saving solution for your office. The cantilever ..
TR10 Desk High Bookcase. 600mm deep unit One adjustable shelf Can be used as desk end sto..
TR10 Wooden Bookcases 18mm Thick MFC Carcass with hardboard backs. FSC C..
TR10 Desk High Cupboard. 600mm deep unit One adjustable shelf Can be used as desk end sto..
TR10 Locking Wooden Office Cupboard is available in 5 MFC finishes (Beech, Maple, Oak, Walnut and Wh.. Tall Mobile Pedestal. Two shallow drawers One filing drawer, suitable for A4 and foolscap file.. The Start Bookcases provide a simple yet practical storage solution ideal for your home or commercia.. The Start Mobile Pedestals are our stylish and practical storage pedestals. They are available in 2 .. The Start Cupboards provide a simple yet practical storage solution ideal for your home or commercia.. The Start Pedestal is part of the Start Office range. It is made to fit underneath the Start Cantile.. The Start Desk High Pedestal is our stylish and practical storage pedestal, it compromises of 2 shal.. The Start Filing Cabinets are suitable for use in both home and commercial offices, available in eit.. The Start Side Filer is ideal for home or commercial office use. The Start Side Filer is our heavy d.. The Maestro Straight Desk with Pedestal is available in either Beech or Oak, it features a H Leg Fra.. The Maestro H Frame Straight Desk is our straight office desk suitable for any office environment. T.. The Maestro 25 H Frame Straight Office Desk is available in a choice of 2 width options (1600mm or 1.. Maestro Straight Wooden Desk Rectangular cable managed desk top including back panel Wipe clea.. The Maestro Straight Desk is ideal for both home and commercial office use, it is an 800mm deep desk.. The Maestro 25 Cantilever Frame Wave Office Desk is available in a choice of 3 width options (1200mm.. The Maestro 25 Cantilever Straight Office Desk is available in a choice of 6 width options (800mm wi.. The Maestro 25 Cantilever Corner Office Desk is available in a choice of 3 width options (1400mm wid.. Maestro Graphite Frame Straight Desk with Pedestalrectangular cable managed desktop including a back.. The Maestro 25 Cantilever Frame Corner Office Desk is available in a choice of 3 width options (1400.. The Maestro 25 Cantilever Frame Straight Office Desk is available in a choice of 4 width options (12.. The Maestro 25 Cantilever Frame Straight Office Desk is available in a choice of 2 width options (16..
Rectangular cable managed desk top including back panel Wipe clean 18mm melamine tops meets BS 47.. The Maestro Straight Panel End Desk in available in a choice of 5 colours (Beech, Maple, Oak, Walnut.. The Maestro 25 Panel End Wave Office Desk is available in a choice of 3 width options (1200mm wide t.. The Maestro 25 Panel End Corner Office Desk is available in a choice of 3 width options (1400mm wide.. The Maestro Straight Office Desk features a traditional panel end leg design and is ideal for any of.. Maestro Desk High Bookcase. 600mm deep unit One adjustable shelf Can be used as desk end .. The Maestro wooden bookcase is designed to fit with a choice of office ranges such as the Maestro, .. Maestro Wooden Bookcases 18mm Thick MFC Carcass with hardboard backs. FS.. The Maestro 25 Graphite Fixed Pedestal is suitable for use on the Maestro 25 Graphite Wave and Ergon.. The Maestro 25 Fixed Pedestal is suitable for use on the Maestro 25 Wave and Ergonomic Corner office.. Maestro Desk High Cupboard. 600mm deep unit One adjustable shelf Can be used as desk end .. Maestro Locking Wooden Office Cupboard is available in 5 MFC finishes (Beech, Maple, Oak, Walnut and.. Maestro Home Office Mobile Pedestal made to match the Maestro office range. The mobile pedestals are.. Maestro Desk High Pedestal. 3 box drawers. 2 shallow drawer 1 filing drawer suitable for A4..
Three Drawer Deluxe Mobile Pedestal. Solid 18mm drawer base. Three Shallow drawers. Fully l.. The Maestro range fuses together the very best of the old with the new in office furniture. 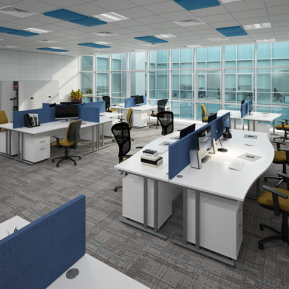 This co..
Atlantis Office offers a wide range of commercial office furniture. Our comprehensive range of commercial office furniture includes desking, storage, filing cabinets, pedestals, bookcases and cupboards. Our commercial office furniture is available in a variety of different options and colours. Commercial furniture can be delivered flat packed or we offer a complete installation service where we will take away all of the packaging for recycling.